What you need to know if you get water in your basement. The Sanitary Sewer Overflow (SSO) annual report is available for review. 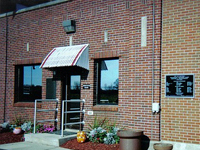 The City of Bucyrus, located in central Crawford County, owns and operates a wastewater treatment facility at 1500 West Southern Avenue in the southwestern portion of the city. The plant discharges tertiary-treated wastewater to the Sandusky River. The city’s original combined sewer system dates from the 1930’s. 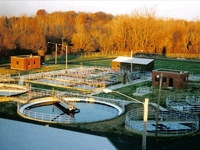 The wastewater plant was originally constructed in 1939 and consisted of the administration building, influent pumping, primary and secondary treatment facilities, and anaerobic digesters. In 1961, a new influent pump building, aerated grit tank, primary settling tank, aeration tank, and digester were added. Plant capacity was increased again in 1988 with the addition of a fourth primary tank and aeration tank, two new final settling tanks, and the tertiary filter facility. The most recent improvement project in 2000 included the addition of the belt filter press and the sludge stabilization facilities. Raw sewage is conveyed to the plant by two deep trunk sewers which converge at the Influent Pump Station. A mechanical bar screen removes coarse and stringy debris from the wastewater and then it is pumped to the pretreatment structure. It is sampled and metered and it flows through the Aerated Grit Tank where denser, easily settable material is removed. The pretreated wastewater then proceeds to the Primary Settling Tanks. Flows in excess of the primary tank capacity are automatically diverted around them. The first step in the sewage treatment process is the removal of the suspended solids carried by the wastewater. After screening and grit removal, the pretreated sewage flows through the four circular primary settling tanks where the suspended material drops out by gravity. The purpose of this process is to reduce the solids load to the secondary treatment process. The material collected on the bottom of the primary tanks is withdrawn as liquid primary sludge and pumped to the plant’s sludge treatment facilities. Floating material is skimmed off and collected in the scum wells. Settled wastewater flows over the discharge weirs and continues on to the Primary Splitter Boxes and then to the Aeration Tanks. Secondary treatment is accomplished in the four rectangular Aeration Tanks and two circular Final Settling Tanks. Primary settled wastewater flows into the aeration tanks where it mixes with a suspension of live micro-organisms known as activated sludge. The mixture is aerated and mixed in order to satisfy the respiration requirements of the organisms as they oxidize the organic matter in the wastewater. Alum solution is added for phosphorus removal and the mixture of activated sludge and wastewater, known as mixed liquor, the flows to the final settling tanks where the sludge settles out. The clarified, treated wastewater, now stripped of approximately 90% of its suspended and dissolved organic pollutants, continues on to the filtration step. The activated sludge is concentrated and collected on the settling tanks bottoms and continuously returned to the aeration tanks by means of the Return Activated Sludge Pumps. Because the activated sludge mass grows and multiplies as it utilizes the wastewater as its food course, excess sludge is periodically wasted to the plant’s sludge treatment facilities along with the primary sludge. Following secondary treatment, the wastewater is filtered as a final polishing step. The tertiary treatment facilities include the Filter Influent Pumps, the four Tertiary Filters, Backwash Tank and Pumps, and Backwash Waste Pumps. The material trapped in the filter is removed by backwashing and then recycled through the Final Settling Tanks. The filtered effluent is disinfected by ultraviolet radiation and discharged to the Sandusky River. Primary sludge and waste activated sludge are transferred to the three circular Aerobic Digesters by the Primary Sludge Pumps. Sludge reduction and stabilization is achieved under prolonged aeration as the micro-organisms consume any remaining nutrients and then starve and waste away. Air for the digesters is supplied by three centrifugal blowers located in the Digester Control Building. There are also transfer pumps and a grinder for moving the sludge among the tanks and to the Sludge Processing Building. Aerobically digested sludge is pumped to the Sludge Processing Building and dewatered to a solid cake on the Belt Filter Press. The sludge cake is then fed to the Biosolids Pasteurization Unit where it is blended with lime and heated to kill pathogens and produce Class “A” or “B” product for agricultural application. The processed material may be immediately loaded onto trucks for disposal, or accumulated on-site in a covered storage area. Basement flooding can occur in some areas due to excessive rainfall, saturated ground conditions, and obstructions in sewer lines.One source of basement flooding can be from structural causes such as cracks in basement walls and floors coupled with saturated soils. Another source of flooding can be from backup of sewage from municipal wastewater collection systems. This may be from illegal material being put in the line, such as grease, diapers, etc. The City of Bucyrus is in the process of separating the storm and sanitary systems. If you live in an area that is separated, water from inside your home must empty into the sanitary line while water from foundation drains, sump pumps and downspouts must empty into the storm system. Problems may also arise when ground water seeps into cracked or broken customer service or city main (storm or sanitary) tile and fills the sanitary sewer lines to levels that exceed their capacity. When the carrying capacity of the pipe is exceeded, the sewage and storm water tend to back up into customer service lines and through floor drains into basements. Basement flooding from cracks and openings in basement walls can be prevented only if the walls and floor are in good condition. Footer drains and sump pumps are desirable in preventing flooding from this source. This type of flooding is beyond the scope of this discussion. Preventing backups from the sewage collection system can be categorized as short term and long term measures. Preparation is the key to emergency prevention of basement backups. When backup is imminent, sandbags should be placed on the floor drains and in the plumbing fixture (toilets) to minimize the amount of water backing up into the basement. An alternative to sandbags would be a rubber plug. These are available at hardware stores and plumbing suppliers. The prices for 3" and 4" plugs are typically less than $5. Immediately stop all water use in the household when backup conditions are imminent or are occurring! problem and someone will return your call. There may be blockages, pump malfunctions or other problems that can be corrected without much delay. Preventive measures are necessary if basement backups from the collection system are likely to occur. The following are suggested preventive measures. Plumbing modifications may be made. Basement floor drains may be permanently plugged or stand pipes, to contain incoming water levels, may be installed. Sump pumps should be routed to run out onto the grass. Basement showers and toilets can be modified to pump into the household sewer at or near ground level. Usually water will not back up into plumbing fixtures at the main floor level. Problems occur in basements because the private service lines are lower than the city's main sewer line. There are also plastic backwater valves. The prices for 3" and 4" valves are in the $30-$60 range. These valves are installed outside in the homeowner's service line by a certified contractor. Another type of valve is a sewer relief valve and cleanout. This valve is installed outside the house and allows overflow at a predetermined level, preventing backup of sewage into the basement. This valve is also in the $40 range. *The City cautions homeowners when using any preventive measures such as plugs, standpipes, or backwater valves. They can be of significant value but none are guaranteed to work every time as conditions may vary during each high water episode. Further, the use of these devices may expose hidden flaws in the home plumbing system that may have gone unnoticed. Pressure changes could reveal other issues in and around the home. Housing stock within the City varies widely from essentially new to homes in excess of 100 years old. 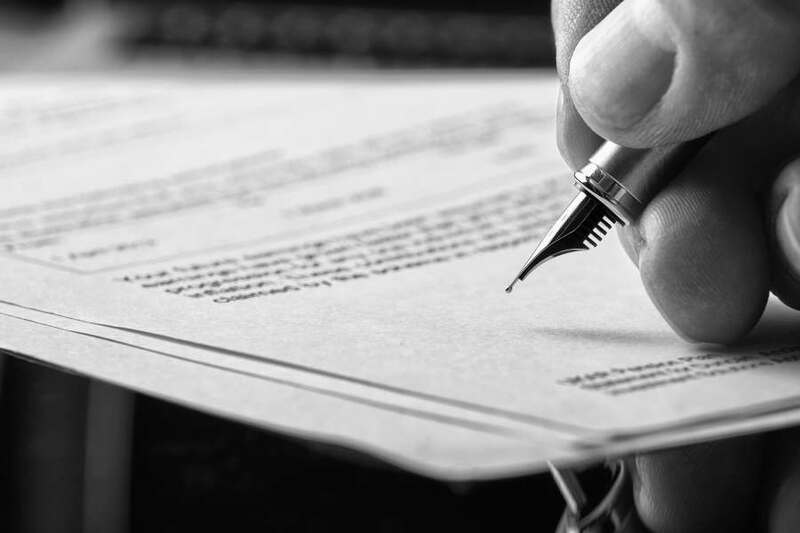 Records of plumbing changes and homeowner activities over the years are impossible to track or accurately documents. Therefore, the City takes no responsibility for the use of plugs, standpipes, valves, etc. First, turn off the electricity and remove the remaining standing water. Materials which have been water soaked should be removed from the basement. Such items could include bedding, rugs, upholstered furniture, boxes, carpeting and padding and papers. With electricity turned off, electrical outlets should be opened and drained and allowed to dry. Duct work should also be drained and allowed to dry. Walls and hard-surfaced floors should be cleaned with soap and water and disinfected with a solution of 1/2 cup of bleach to one gallon of water. DO NOT MIX BLEACH AND SOAP. When using bleach, make sure the area is well ventilated. Thoroughly disinfect any food service areas or areas where children play. Salvageable items should be dried within 24- 48 hours to reduce chances for mold and mildew growth. If insulation, paneling or sheetrock have become wet, it will need to be removed. Allow plenty of time for drying before reinstalling insulation to prevent mildew. If you have any cuts or sores, avoid contact with the water. If they come in contact with this water, wash them thoroughly afterwards to control infection. If a wound develops redness, swelling or drainage, seek immediate medical attention. Disinfect toys using a solution of 1/2 cup of bleach to one gallon of water. Anyone receiving a puncture wound or a cut while cleaning up should have a doctor determine whether a tetanus booster is necessary. The City of Bucyrus wishes to inform the public that there are times when the sewer overflows along the Sandusky River which through rainfall or sewage blockage, could and often do overflow to the river. Bacteria discharged along with this sewage can cause a number of health risks due to exposure. They ask that during times of rain and immediately thereafter, or if you notice an overflow discharge do not utilize the river for any recreational propose. If you have any questions, you may call the Waste Water Superintendent at 419-562-8981. The Sanitary Sewer Overflow (SSO) annual report is available for review at the Bucyrus Wastewater Treatment Plant, 1500 W. Southern Avenue, Bucyrus. If you have any questions or concerns please feel free to contact Terry Spiegel, Bucyrus Waste Water Treatment Plant Superintendent, at (419) 562-8981.